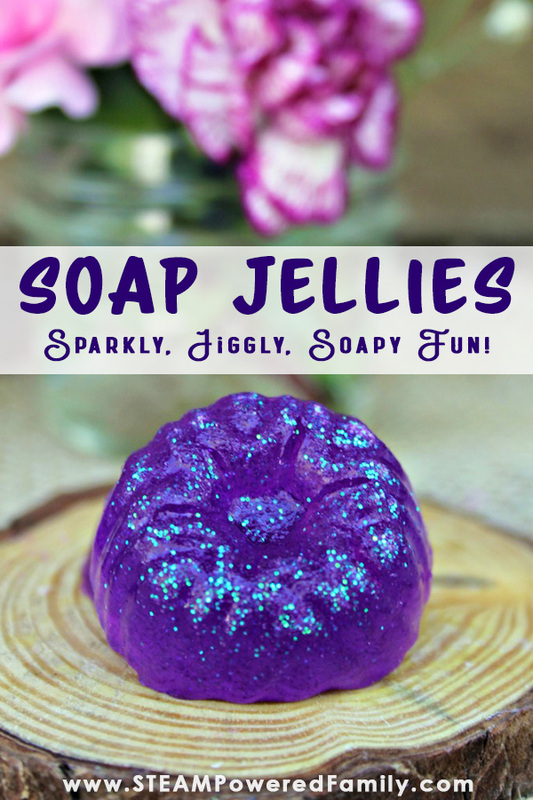 Jelly Soap Making - Sparkly, Jiggly, Soapy Fun Jellies! 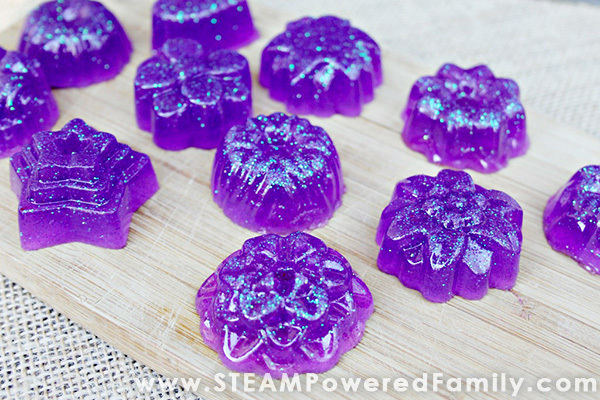 Soap Jellies or Jelly Soap are all the rage! 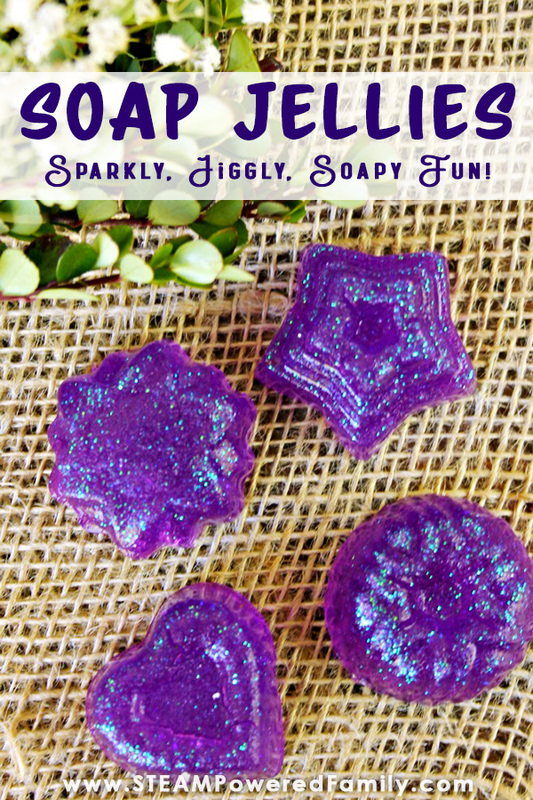 Kids love these squishy, playable soaps that provide a great sensory experience. Even better, you can easily make these at home, making this a fantastic DIY soap project for kids and teens! We’ve been having a lot of fun learning how to make various soaps and bath products. Last year we made our own Playdough Bubble Bath that was such a BIG hit with my kids. We’ve also made bath bombs (and slipped in a chemistry lesson), plus regular soaps. This year the kids want the squishy, playable soap that can be used in the bath, shower or just at the sink. It’s sensory, it’s fun and kids love them! One quick word of caution, if you have kids that might mistake these for gummy candies (and yes the consistency is very similar to our yummy, delicious gummies), and try to put them in their mouth, maybe delay making these until your kids are a little older. In total it takes about 2.5 to 3 hours to make these soaps. 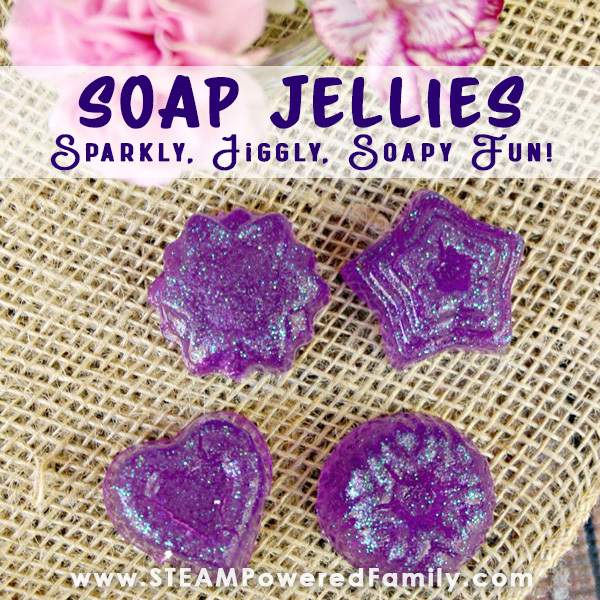 Kids can work in teams or individually to make their own special soaps. This is a great product for the holiday season to create some special gifts. Check out this quick video tutorial or skip down to the write up with all the details. Add your unflavored gelatin to a medium size bowl. Then add the warm water and whisk until dissolved. Add salt, body wash, essential oil and glitter (if being used), food colouring and give it all a good whisking to blend the ingredients. Just like when we made the solid soaps, you want to spray mold with rubbing alcohol to prevent bubbles, before adding the jelly soap mixture. Place the silicone mold on a tray then carefully pour the mixture into molds. Place the whole thing in the fridge for at least 2 hours to set. Once they are set, carefully pop them out of the molds. They are ready to use or you can store them in an airtight container or ziplock bag until you are ready to use them. I also recommend storing them in the fridge until you are ready to use them, as they do get melty.